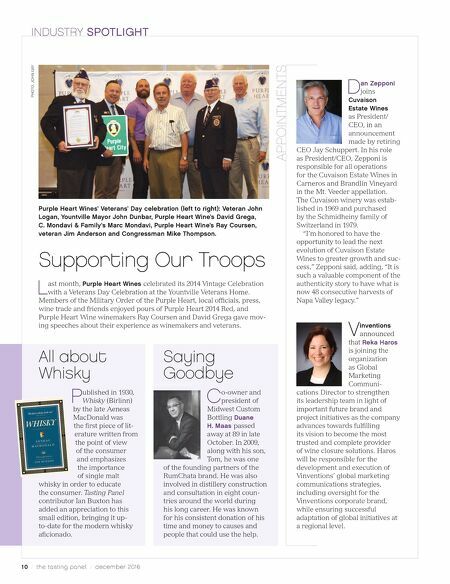 10 / the tasting panel / december 2016 INDUSTRY SPOTLIGHT Supporting Our Troops L ast month, Purple Heart Wines celebrated its 2014 Vintage Celebration with a Veterans Day Celebration at the Yountville Veterans Home. Members of the Military Order of the Purple Heart, local officials, press, wine trade and friends enjoyed pours of Purple Heart 2014 Red, and Purple Heart Wine winemakers Ray Coursen and David Grega gave mov- ing speeches about their experience as winemakers and veterans. All about Whisky P ublished in 1930, Whisky (Birlinn) by the late Aeneas MacDonald was the first piece of lit- erature written from the point of view of the consumer and emphasizes the importance of single malt whisky in order to educate the consumer. Tasting Panel contributor Ian Buxton has added an appreciation to this small edition, bringing it up- to-date for the modern whisky aficionado. Saying Goodbye C o-owner and president of Midwest Custom Bottling Duane H. Maas passed away at 89 in late October. In 2009, along with his son, Tom, he was one of the founding partners of the RumChata brand. He was also involved in distillery construction and consultation in eight coun- tries around the world during his long career. He was known for his consistent donation of his time and money to causes and people that could use the help. D an Zepponi joins Cuvaison Estate Wines as President/ CEO, in an announcement made by retiring CEO Jay Schuppert. In his role as President/CEO, Zepponi is responsible for all operations for the Cuvaison Estate Wines in Carneros and Brandlin Vineyard in the Mt. Veeder appellation. 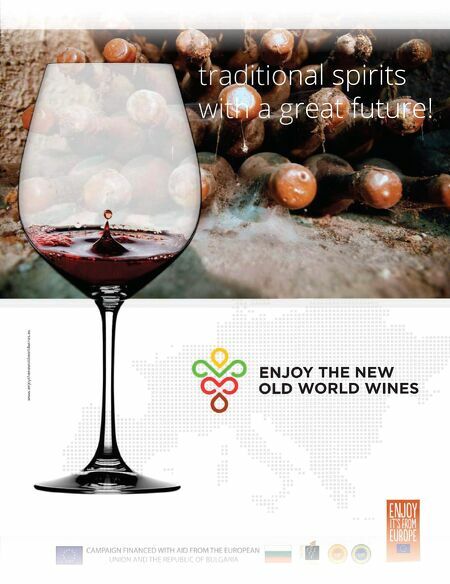 The Cuvaison winery was estab- lished in 1969 and purchased by the Schmidheiny family of Switzerland in 1979. "I'm honored to have the opportunity to lead the next evolution of Cuvaison Estate Wines to greater growth and suc- cess," Zepponi said, adding, "It is such a valuable component of the authenticity story to have what is now 48 consecutive harvests of Napa Valley legacy." V inventions announced that Reka Haros is joining the organization as Global Marketing Communi- cations Director to strengthen its leadership team in light of important future brand and project initiatives as the company advances towards fulfilling its vision to become the most trusted and complete provider of wine closure solutions. Haros will be responsible for the development and execution of Vinventions' global marketing communications strategies, including oversight for the Vinventions corporate brand, while ensuring successful adaptation of global initiatives at a regional level. APPOINTMENTS PHOTO: JOHN GAY Purple Heart Wines' Veterans' Day celebration (left to right): Veteran John Logan, Yountville Mayor John Dunbar, Purple Heart Wine's David Grega, C. Mondavi & Family's Marc Mondavi, Purple Heart Wine's Ray Coursen, veteran Jim Anderson and Congressman Mike Thompson.